Last month I had a meeting in Seattle so we decided to bring the whole family and make a trip out of it. We’ve always wanted to take the train down the coast so we decided this was the perfect opportunity. 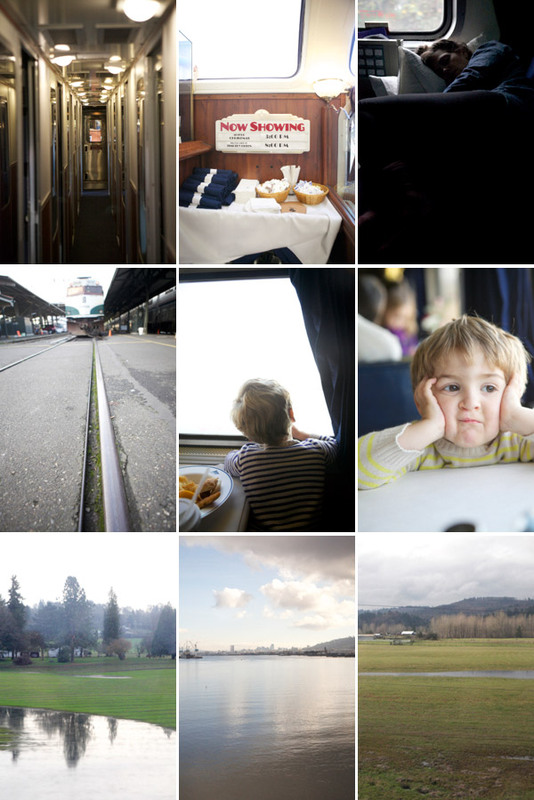 We flew up to Seattle, had a few fun days to explore the city and then boarded a train in Seattle in the morning. It was kind of an interesting adventure so I thought I would share it here in case anyone wants to try it. The airplane tickets at the time were around $100 each way and the the train tickets were $75 each way. The train from Seattle to San Francisco takes 24 hours so we decided to upgrade to the sleeper car. (I was worried about the kids being noisy at night and disturbing other people.) The sleeper car was about double what the plane tickets would have been (but it also includes meals). After a couple of hours on the train we were joking that we could have been home already. While the train was really cool, it isn’t the most time or cost efficient way to travel. Make sure you are doing it for the experience or you’ll be disappointed. We arrived at the train station about 25 minutes before the train left. There were only a few other people in line so getting on the train was so easy. There was no taking off your shoes or putting everything through x-ray machines. It happened so fast that I can’t remember but I think we just walked through a metal detector. Within 5 minutes of arriving we were settled in our sleeper cabin. After we tucked away our bags the agent came by to offer us Champagne and Martinelli’s. It was so fun and we were all excited. The family sleeper cars felt spacious. I was worried I would feel cramped but that wasn’t the case. The scenery was beautiful and breathtaking. It is so great to curl up next to the window and watch the country go by, this was my favorite part. The train traveled all along the water as we headed south to Oregon. It felt really relaxing. While an airplane is a lot faster, the train felt a lot more comfortable. The best part about the train is you can get up and walk around to do stuff, and there is actually stuff to do. 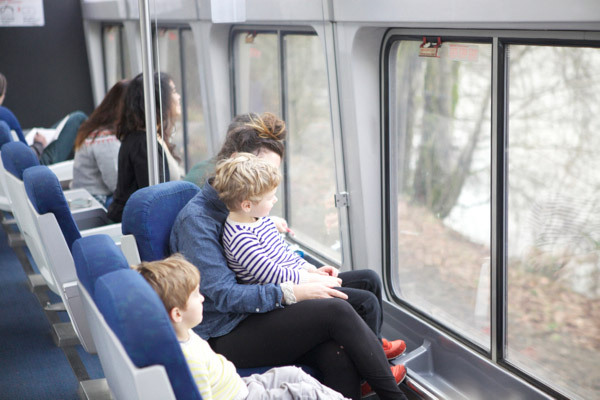 The observation car is a car that is floor to ceiling windows. You could go and relax and watch the scenery, it was really beautiful. They also had a Theater car where they were showing Arthur Christmas, which kept the kids entertained. At one point Roman got a little antsy so we walked through all the cars to the caboose to look out the back window. There was also the dining car that served meals. The agent came around before every meal and made a reservation. The food was fine, edible but not amazing. But everything was served fancy like you were at a restaurant. It was fun to eat with a view of Mount Hood out your window. When it was time to sleep the agent helped us fold down our beds into double bunk beds. I didn’t get a picture of this but it felt roomy and comfortable. Kate had recommended we bring our own pillows and I was glad we did. The train ones weren’t awful but the room had the vibe like a hostel so it was nice to have some comforts from home. If I was ever going to take a longer trip I might even bring a blanket too. We had a great experience and have even been talking about taking a train trip across the country sometime. I would love to hear if you’ve had any train experiences traveling in the U.S. P.s. 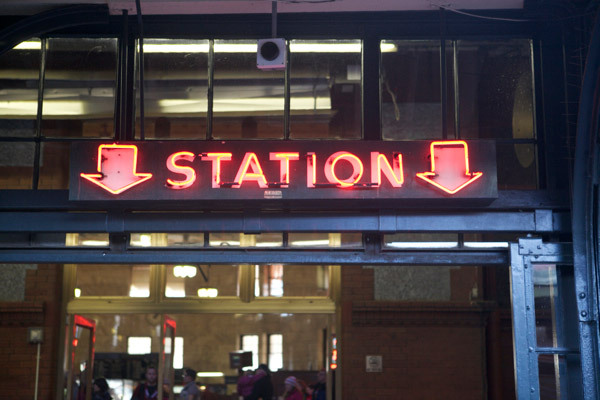 : Find some train travel tips at the end. -Get a sleeper car if you can splurge. -Plan your trip so you see the beautiful parts when there is light out. During my childhood, every big vacation involved going cross-country via Amtrak (We lived in southern California and had extended family in the mid Atlantic states). At the time I felt like an oddball among classmates, since I had never been on an airplane, but now I couldn’t be more grateful for those experiences. There’s something very moving about seeing the country you live in, up close, across all those miles and landscapes. Due to a health issue and pressurization when flying I have not flown since 10 days before Sept 11. I have however gone across country to the West Coast and to the East Coast and down to Florida. I have also taken a train in Europe having gotten there via boat. It is a wonderful way to relax and see the country. I often travel on the Capitol limited between the Washigton DC area and my home in Ohio. We board a bit down the line from DC at one of the smaller stations, this is nice because we can park for free right next to the station. We usually ride coach since the trip is short; the one time we had a sleeper it was really nice, though. There’s lots if leg room in coach, and my son, especially sleeps really well. I’ve always found the train much less expensive than flying, especially since kids go on a half price ticket. we JUST took the train from springfield, massachusetts, to chicago over the holidays – me, my husband, and our 2.5 year old twins. we didn’t get a sleeper, but made tents with blankets over the seats and the girls slept soundly. i was amazed, walking to the back of the train the next morning, how very many babies and kids were on the train. it was such a civilized, relaxing way to travel. by the time i get off a plane, even after a short flight, i always feel so rotten, but the train trip was pretty refreshing. we are looking forward to doing it again! without the sleeper, 4 RT tickets were less than one RT plane ticket, so it was also a bargain. Wow, the train itself just looks lovely ! We’ve been on the Flying Scotsman ,which is the overnight from London up to Scotland and it felt like something from a time gone by. I’m going to put this on my list for when the kids are a little older, we’re hoping to take a good few weeks to travel around America & this looks perfect! Many thanks for sharing it. I’ve been on long train rides in Europe, but never in the U.S. Why in the world did it take 24 hours? That’s about double the time by car (if you didn’t stop while driving) Were there multiple stops? My experience with trains has always been about the same travel time as driving or less. I’m not sure I could have been confined for 24 hours. When we were traveling with our kids (6,6,4) around China we took a 24 hour train ride from Beijing in the North to Guilin in the south. We did it because it was cheaper but also, as you mentioned, because it was such a perfect way to see the countryside. The kids really loved it and we found it was incredibly relaxing. We made sure to have some small activities for the kids (playdough/books/art supplies) and lots of snacks. And it really was a highlight of our trip. Did you find it easy to drift off? On honeymoon traveling around in Italy we got from Rome to Venice by train. Just some hours but FAB! How fun for your family! When I was 20, my sister and I took the train from Portland to New York; what an unforgettable experience it was. It’s such a unique way to travel the country. I think my favorite parts were: waking up to the majesty of the Rocky Mountains, and sitting in the observation car to watch the most amazing lightening storm! 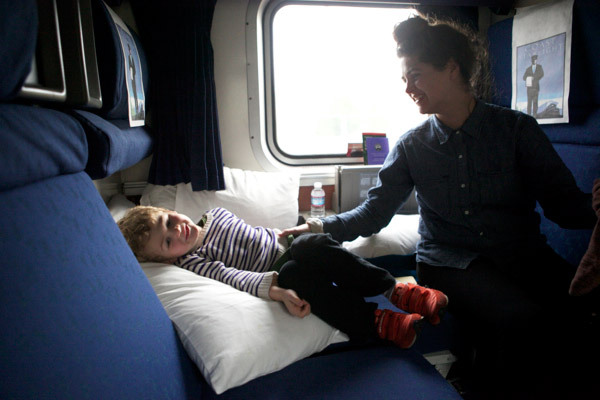 I agree with you- if you can splurge for a sleeper car–do it! I haven’t seen viewing seats like that outside of Europe. granted, i haven’t taken Amtrak extensively in the U.S. but that must have been such a treat! The trip looks pretty great. This looks like so much fun. It is totally on my list of things to do before I die! 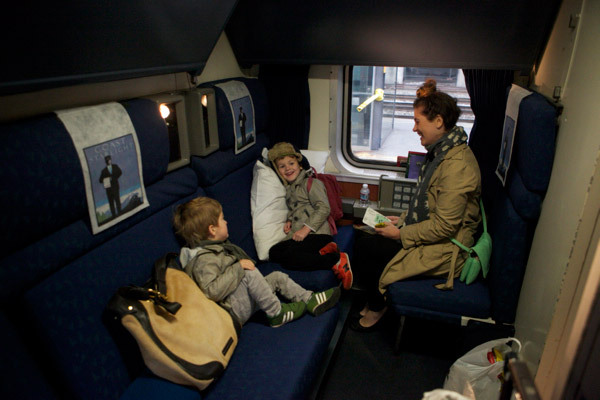 I have taken Amtrak from Denver to Chicago which was a not so pleasant experience, but it could have been nice if it didn’t stop in Omaha while we were all asleep and thought we would be there when we woke up the next morning… ! EEK! ANYWAYS. I am planning to do it again as I think that traveling by train in such a vast country must be so breathtaking. I bet up the coast it was to die for. this looks awesome! i have traveled from philadelphia to montreal by train, for cost reasons, and loved it. i would like to do this trip again with my husband and daughter this summer and upgrade to a sleeper… i loved looking at the scenery on the train – it made me realize how pretty pennsylvania is. i am sure that california was amazing to see! Train travel is so romantic and the photos perfectly illustrate that. I have thought about doing this train ride and I am going to seriously reconsider it! Wow really interesting to read about this trip. Thanks so much for sharing! I love those side ways seats that face the window – what a simple but great idea. And the theatre room sounds fun! I wish the Shinkansen had these! I took the southwest trip when I was eleven, then again a few years ago (Kansas to Los Angeles) at 22. Both times I remember thinking how time seemed to go by. As a child I was very very interested in prairie life and the wild west so I really liked it. I do think that flying one direction and taking the train the other direction is a great idea. Funny how Kansas to LA and Seattle to San Fran took the same number of hours!! I took the Empire Builder from Portland, OR to Chicago, IL this September (and back in October). I loved it. I didn’t get a sleeper, I just slept in the coach seat. Which was fine for me. I brought a blanket and a neck pillow (must-haves IMHO) and my own snacks and food (sandwiches, pretzels, raisins, etc. and Gatorade). I love that I could check 2 bags for free and bring my backpack, a carryon suitcase, and my camera bag. Room for lots of stuff. Not having a shower for 48 hours was the biggest challenge, but honestly, it wasn’t that big of a deal. It was an amazing trip. So beautiful starting in the Gorge and then seeing Glacier NP the next day. ND is pretty bland, but when you get toward Minnesota and Wisconsin and you have trees and rivers, the scenery picks up again. It was a huge cost-saver for me and I would travel that way every time if I could. It was absolutely beautiful. I spent all of the daylight hours in the observation car (getting there early before it was crowded and staying until it got dark) and I loved being able to see so much from the huge windows. It is such a lovely way to travel-you can move around and actually see more of this beautiful country we live in. I cannot wait to do it again! Oh, I would love to travel across country by train. It’s on my list of things to do one day. Looks like you guys had a lot of fun! My love of trains is about equal to that of a 3 year old boy. I just can’t get enough of them! I love how you captured the whole trip with your beautiful photos! We took a train ride from Seattle to LA and back when I was fourteen, which was magical and wonderful until the last six or so hours when we had to get off the train for some reason and ride a bus…which then broke down…I can’t quite remember, but it was a long end to a long trip. I remember the wooded hills/mountains as we went through Southern Oregon being absolutely beautiful as night fell. I also remember stopping at the station in Portland and having teriyaki chicken for the first time. Later in life, I helped my then-fiance, now-husband move back to Seattle from Chicago after finishing grad school. It was less fun than I remembered, though that was mostly because the food options were scarce for us vegetarians. Hopefully that’s changed in the last decade, because I’d really like to go on a long train ride with my little train lover sometime soon. I remember doing this with my family when I was a kid, except we took it from toronto all the way to san francisco. it took 3 days with a layover in chicago. it was a lot of fun then. fast forward to taking it as an adult, not quite the same. I do thinks it’s lots of fun for little ones and I plan on taking my little when he gets a little older, especially since he’s into trains. oh, I bet the scenery was beautiful down the coast! I once took that train on the same segment, what a blast ! Ooooh West Coast I miss you. How cool! I love how the regional lines have different character, definitely not the case with regional airline carriers. I second the recommendation to bring your own food and snacks. They sell out of food and beverage items on longer haul, well-sold trains. During my trip from Cleveland to Boston over Christmas, they were down to hotdogs and chocolate bars by dinner time. As someone accustomed to the microbrews and whoopie pies sold on the Downeaster service, I was really grateful that my mom had sent me off with turkey sandwiches! My husband and I took Amtrak from NYC to Indiana for a summer holiday weekend (4th of July). It was fun and novel at the beginning, but I strong urge everyone to pony up for the sleeper car. A long trip is NOT WORTH IT unless you have a little privacy. Essentially it’s just a step above a Grey Hound bus – people putting their feet up on the top of your seat, loud talkers in the middle of the night and on our return trip – only single seats for the first two hours (we boarded at 1am!) Woof. Your trip looks like fun! Sleeper car all the way! Very interesting to read about this, it makes me want to go on a train trip in the US, especially with those windows. My husband and I moved from Chicago to Berkeley last summer. I grew up listening to my grandfather dream of making a trip to California on the train, so we decided to invite my grandparents to make the move on the train with us. With each person allowed 3 checked bags, we were able to move everything via train – including our bikes. The first day’s scenery, was beautiful in its own way, but the second day – once you get to Denver – is truly amazing. The scenery is just incredible. The trip was really amazing. And while it is definitely more expensive than flying, you are totally right, it should not be compared. It is like a mini vacation with meals included. We each got a sleeping car, and asked for the door separating our rooms to be unlocked, so we ended up with quite a bit of space. We played lots of dominos and cards, chatted and enjoyed the view. My grandmother passed away about 2 months after the trip, so without a doubt I will always treasure that time. There is something really nice about taking trips with family and the train allows for everyone to relax and enjoy the ride in a way that driving does not. And airplane travel can be very nerve wrecking for older people. what an adventure! i’ve never traveled by train before but it’s one of those things that i’d like to do at least once in life. and i love how they made the experience extra special with champagne, dining and entertainment. so fun! So glad the trip went well! It’s funny because after I gave you those tips, we took the train to Austin and it was AWFUL. Nothing to look at nearly the entire trip, there’s no parlor car (that only exists on the Starlight! I did not know that, game changer), raw sewage smell pumped into our room all the time & they couldn’t fix it or move us, and we had to change cars at 4am to transfer to Austin, which sounded like NBD when I booked it, but it ended up being horrible. A lot of it was not particularly Amtrak’s fault, obviously (besides the smell! ), but it made me realize that the Coast Starlight is the BEST line. 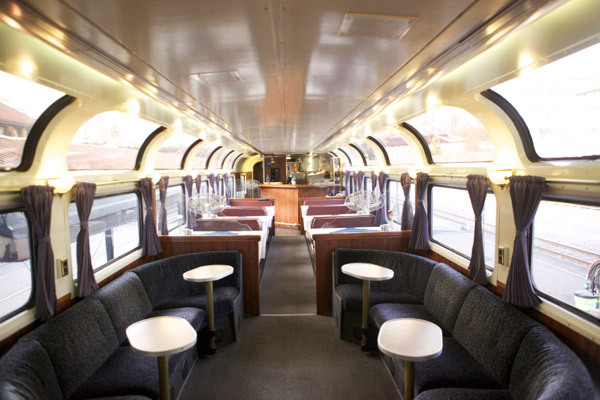 We met lots of couples on the train to Austin, since the regular dining cars you have to dine with other people (sometimes great, but sometimes you just don’t want to be chatty), and many said the Starlight was the best and second in line was the train to Chicago from SF. So, maybe I’ll try that some day… Ok, this novel is over! This sounds like a great adventure. I really enjoy the pictures of your kids. They are always so happy! A good friend of mine took a train rise from st.louis to california to seatle and loved it! I’m not sure I could get that much time off from work at once to have enough time to enjoy it like I would want to, but it sounds fun! I love hearing about your experiences! I have been missing these wonderful posts, you write them so well. And of course, now I want to take the family on the train! Jordan, can you please publish a post with your San Francisco highlights soon? Your SF Eats is glorious but I would love to hear about your picks of things to do in the city, especially with little ones!! We love the train. 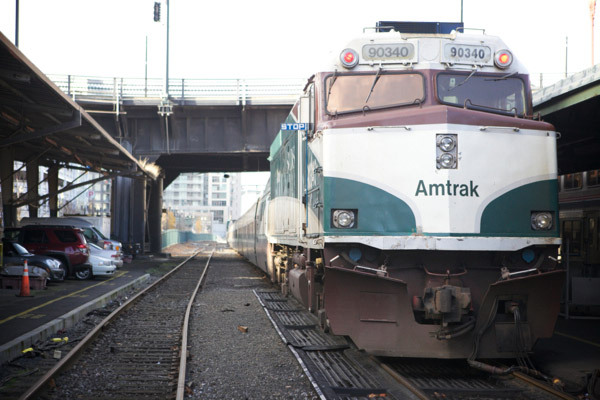 We take it often up to Seattle, we have not tried the sleeper car, thanks for the tips! We lived in India in the 1990’s and although the sleeping cars are more affordable, the Amtrak Line feels downright opulent…Xo. Wow! love that train! I would really like to do that trip! I only made one long trip on train and loved it! It was one day trip from Buenos Aires to Tucuman (I live in Argentina), we also travlled in a sleeper car. Highly recommended. Although is not as fancy as the train you´ve travelled, its really nice. i have actually never taken a train in the usa. every time i go to europe i take full advantage of their train system, but perhaps it is just the size of our country that intimidates me. i do love the comfort and scenic beauty of train travel however, so i will need to give it a try sometime! 2 years ago we took the train from Cleveland to NYC. There were 7 of us so it was much cheaper than flying. It’s a long ride, but I love to read & nap so I was in heaven. The 3 teenage boys had fun with their computer. We packed our own snacks – including the knife to cut the cheese & sausage, so differant than flying! We bought a “blanket” as a souviner and didn’t have a sleeper car but a lot of the time the train was empty. It’s a differant way to travel and would bring my pillow & blanket next time but if you have the time to spare it’s a fun way to go! i love taking the train, it is so relaxing, as long as you are equipped with snacks, blankets and reading material! It is always fun with friends too, you can bring games and have a good time! I’ve taken it many times from Montana to Minnesota! It was so nice to see this post, because I love train travel. When I was a couple of years out of college, I desperately wanted to travel around the US, but all my friends had jobs. Since, as a 22 year old young woman, it wouldn’t have been safe for me to drive alone cross country, I traveled by train. I started in New England, went over to Chicago, down to Austin, and then spent weeks going from Austin to LA to San Francisco to Portland and finally to Seattle. It was one of the greatest trips ever. I took the train you were talking about with the observation room, and had one of the best dinners of my life with 3 other strangers in the dining car (all of us were traveling alone, and they seat singles together at one table). Three of us were young college kids, and then an older gentleman. We talked for hours- about youth, the world, everything. Funny thing is that I got the idea for my blog on this trip while traveling through Texas. I am actually getting the itch to take a train from NYC (where I live now) down South again. Cheers to the awesome post! Oh, I forgot to mention- this was about 15 years ago before cell phones, wireless connections, laptops, etc. so it was really a great trip– meeting people, reading, watching the scenery. It might not be as meaningful now with an iPhone to distract me the whole time. lovely! i’ve been wanting to take that train ride, now i might just have to! Beautiful shots, Jordan. Seems like such a fun adventure. We took a short train ride last summer and my little guy was mesmerized with the views. I’m hoping to take a longer trip this year.